Economic Forecast 2019 will be held on Thursday, January 31stfrom 7:30-9:00am at the Bremer Conference Center at Danville Area Community College. The event will feature a report from Vicki Haugen along with interactive discussions focusing on Manufacturing, Health Care and Education. Tickets are $10 each with proceeds being directed to the Vermilion Advantage in support of their workforce development programs. Classic Homes Reality is the presenting sponsor of the event, which will also be broadcast LIVE on 1490 WDAN and VermilionCountyFirst.com. “We saw an opportunity to bring the business community together and focus on what is an exciting picture with our local economy,” says Neuhoff Media General Manager Michelle Campbell. “The event will feature interactive discussions on key economic sectors rather than a series of speeches. We are excited about the response to Economic Forecast 2019 so far,” added Campbell. 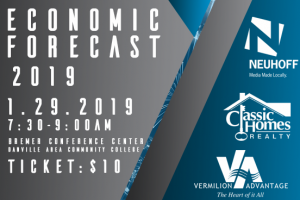 Tickets for Economic Forecast 2019 go on sale beginning Monday, January 7that Neuhoff Media, 1501 North Washington Ave, Danville. Neuhoff Media along with Danville Area Community College is hosting the event in support of the Vermilion Advantage. Neuhoff Media Danville, owns and operates local radio stations WDAN-AM, WDNL-FM and WRHK-FM along with VermilionCountyFirst.com.